Young community members make feather quills and sign their names with blackberry ink. Photos by Vince Bellofatto. 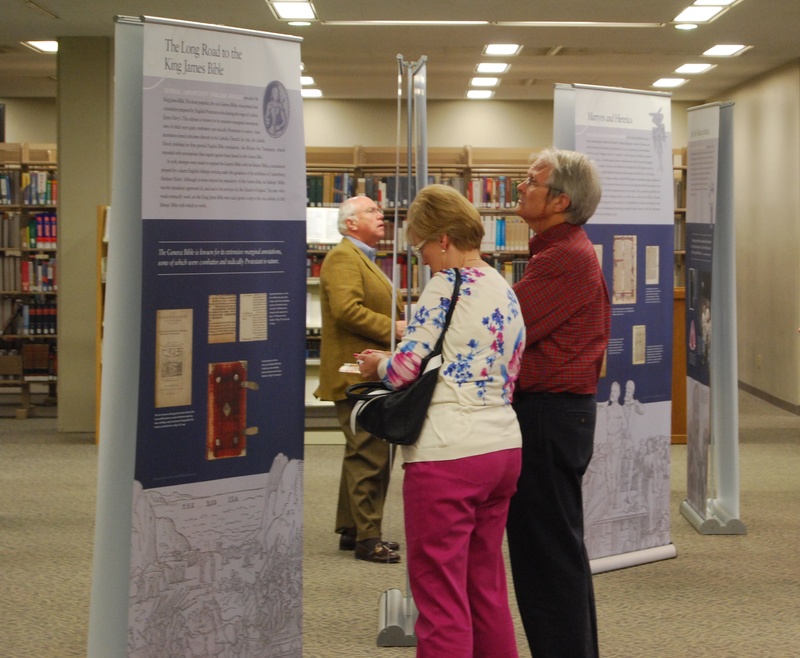 On March 8, the City of Tuscaloosa welcomed the Manifold Greatness traveling exhibit to the Tuscaloosa Public Library, a highly anticipated event in a region that lies in the heart of the Bible Belt. Five displays, which were curated by the library, are scattered throughout the building to enhance the Manifold Greatness experience. These displays offer visitors the chance to experience physical representations of the topics discussed within the Manifold Greatness exhibit, such as the history of books, papermaking, bookmaking, the literary influence of the King James Bible, and what the Bible has become today. Dr. L. Jeffrey Weddle’s presentation during the Opening Ceremony. 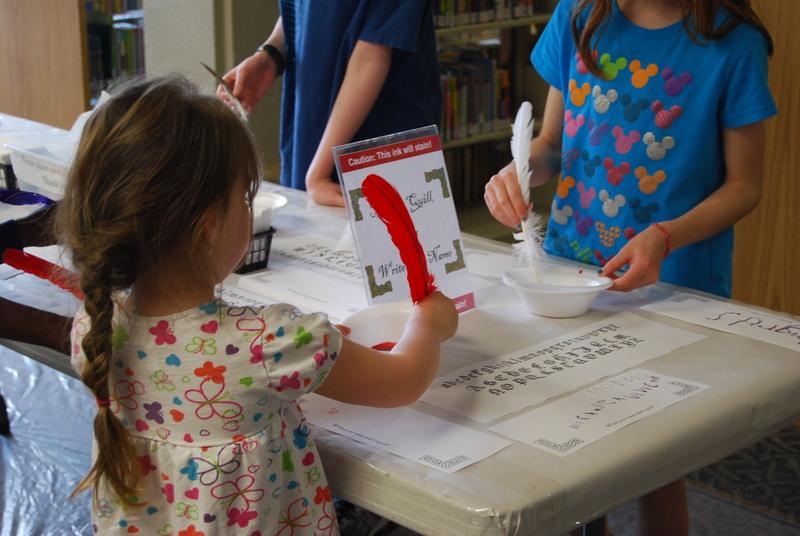 As an added bonus, the Children’s Department gave patrons a guided tour through the history of bookmaking, starting with a discussion of early bookmaking and the various materials that have been used to make books, followed by a feather quill making activity. After reading the story The Ink Garden of Brother Theophane by C.M. Millen, participants saw a demonstration of making blackberry ink and were able to use their new quills to sign their names. Tuscaloosa community members view the Manifold Greatness exhibit. From there, they were offered the opportunity to hear from Christopher Davenport and Laura Rowley, students from the University of Alabama Book Arts Department, with lessons and hands-on activities on letterpress printing, bookmaking, and papermaking. 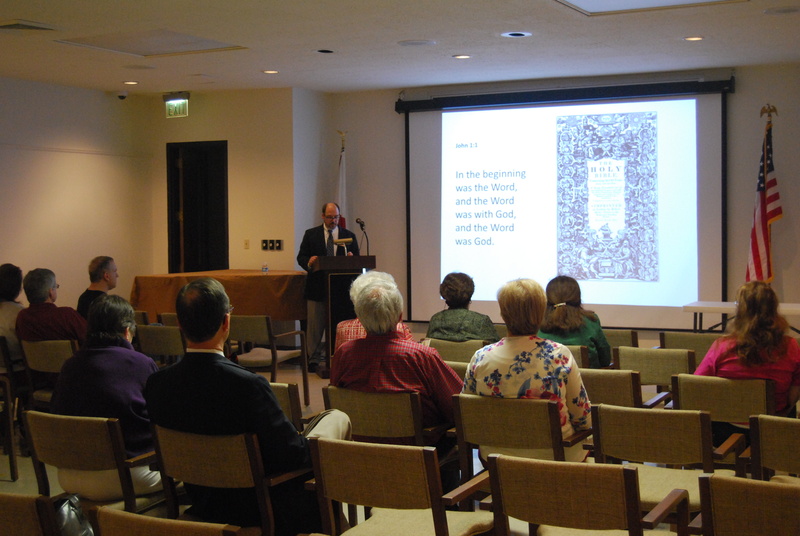 In the coming weeks, the library is looking forward to the many special groups scheduled to attend the exhibit and will be hosting two additional programs geared towards engaging our community in the history and influence that the creation of the King James Version had on the world. Susana Goldman is Reference Librarian at the Tuscaloosa Public Library in Tuscaloosa, Alabama.